After so many posts on our Italian adventures and our little February flood, it’s time for a good old-fashioned farm news update. Once again, we’re spending the late winter building greenhouses. Five of the six years that we’ve been farming have included new greenhouse construction – three at the old farm and both of the years we’ve been here on our new property. 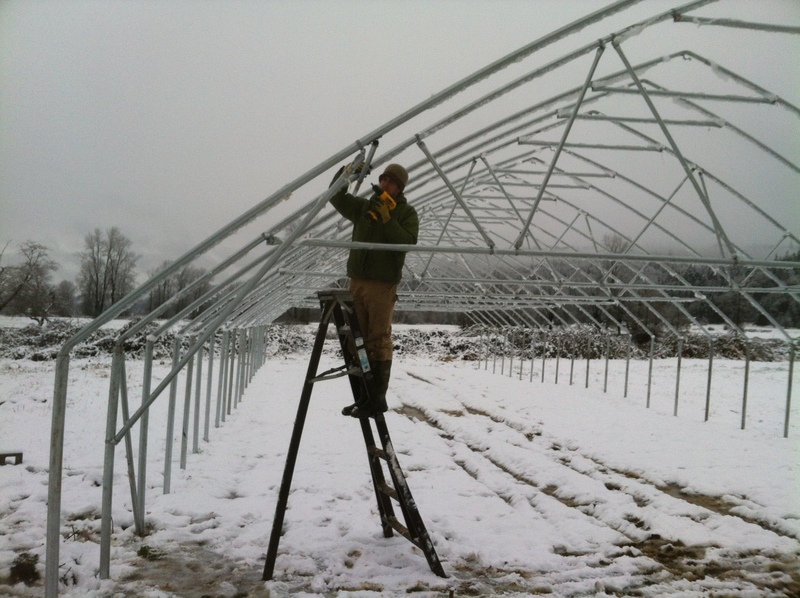 I wish I could say we were expanding the area we have under cover, but in fact we are replacing two 30’x90′ greenhouses that collapsed under the weight of rain-saturated snow just before we left in January. 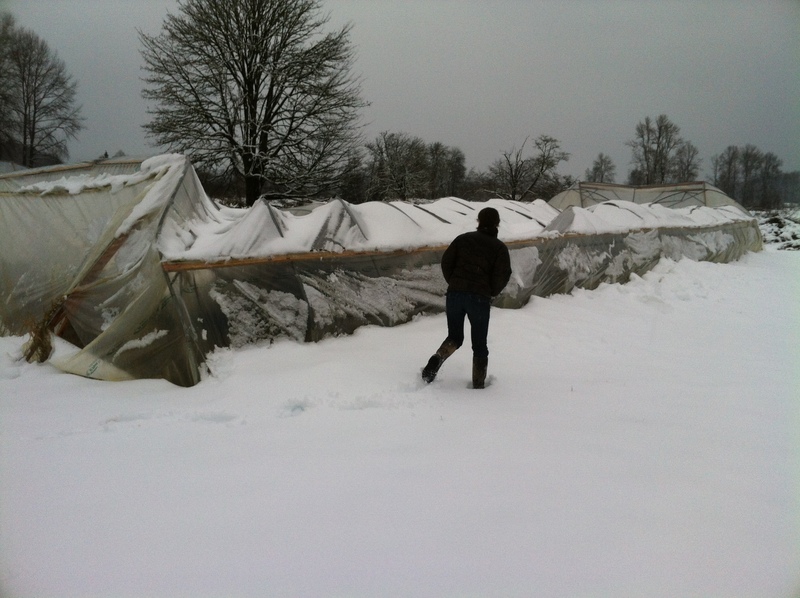 We weren’t the only farm to lose greenhouses in the January snow event – the snow was so laden with water that one of our neighbors physically could not push the snow off the plastic. We’re living in Seattle right now while we attempt to remodel our farmhouse kitchen, and we weren’t able to drive out to the farm during the snowstorm, so our greenhouses didn’t stand a chance. The good news is that the greenhouses we lost were (relatively) cheap, bought used on Craigslist, and our seedling greenhouse, which we bought new last year, weathered the storm just fine. Our old greenhouses were an ongoing source of stress. Their flimsy metal hoops meant they were vulnerable to snow, and they wiggled disconcertingly in the wind. We were hoping to get more than one season’s use out of them, but we’re glad to be replacing them with something much better. 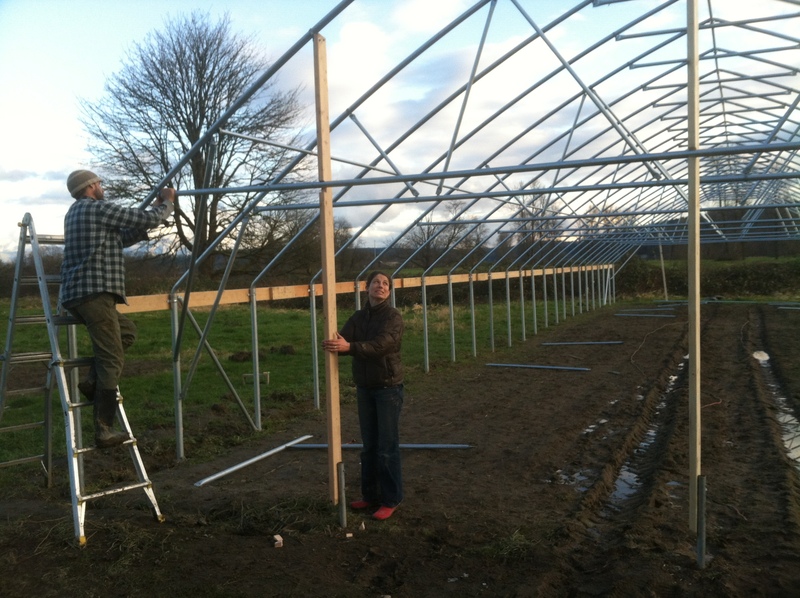 So, greenhouse construction is once again on our agenda for February and March. Number one is already almost finished, and number two should be done in a couple weeks. 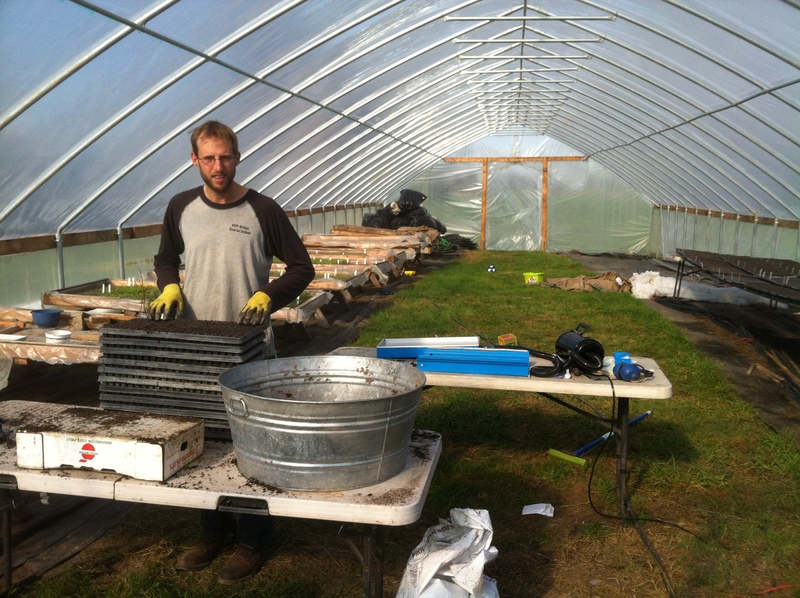 Between me and Jason, we’ve built or helped build twelve greenhouses. We are getting really good at it. Of course, there’s other work happening as well. Our weekly seeding regimen is well underway, with somewhere around 15,000 seedlings already growing in trays in the greenhouse and under lights in our office trailer/germination chamber/farm stand: lettuce, kale, kohlrabi, chard, lots of onions, artichokes (! ), tomatoes, leeks, parsley, celeriac, fennel, and more. With a little luck in the weather department, some of these will be going out into the field in a couple weeks. 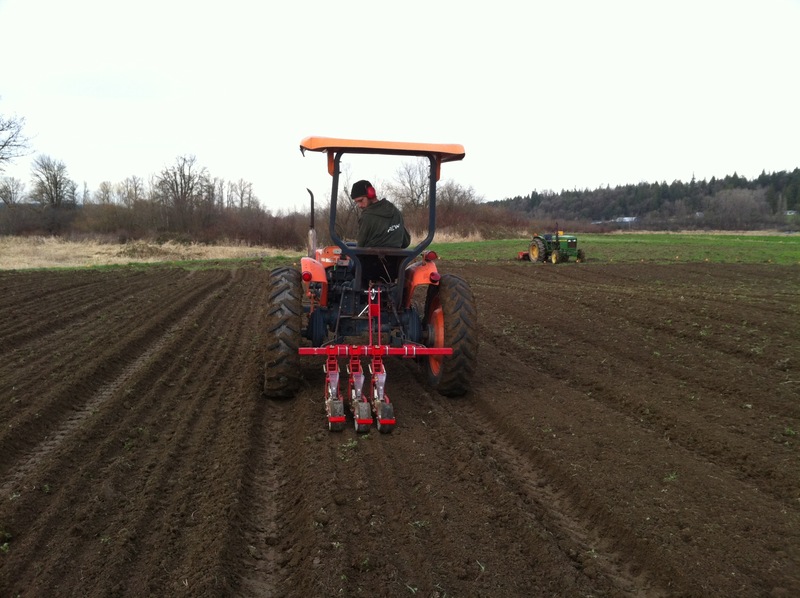 Speaking of luck in the weather department, just yesterday we used the last hours of a very short break in the weather to get our first seeds in the ground in our main fields. We sowed radishes, mustard greens, arugula, kale, bok choi, and lots of other greens. It’s always a relief to get something planted in the field at this time of year. With ten days of rain on the weather forecast right now, it seems possible that yesterday’s seeding might be the only one we get in during the month of March. It’s highly unlikely that this March 8th sowing will produce anything for us to harvest by our first Broadway Farmers Market, opening on April 22nd this year. The good news is that we have lots of overwintered crops in the field, all of which were spared by our late February flood. Of course, we could still have a freak flood or freeze event between now and April 22nd, but if not we’ll have lots of parsnips, carrots, kale sprouts, and beautiful radicchio! We’re also doing lots of less-photogenic behind-the-scenes work. As usual, we have lots of ideas about how to do things better this year. We’re trying some new crops, putting more effort into our little farm stand, and adding the Duvall Thursday farmers market to our weekly schedule. What I’m most excited about is our plans for our Community Supported Agriculture program. After five years of sticking with a 20 week schedule, we’re embarking on a long-term plan to extend our season. This year we’re just adding two extra weeks, but are growing a lot more storage crops than ever before, giving us the possibility of offering more late-season produce options to our CSA members. When we ponder the future and our vision for the farm’s growth, we see the CSA as the most likely means to reach a size and scale that is sustainable for our land and ourselves. We love the farmers markets, and I think we’ll always include a few markets in our business model, but, compared to the CSA, they require a whole lot of time off the farm. As our markets get busier (which is great!) they require more people to staff the booth on market days. 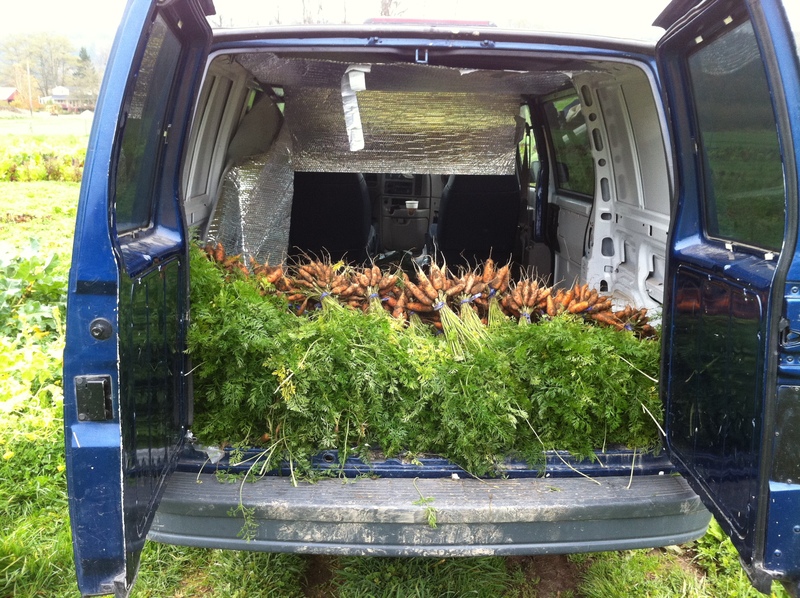 As the CSA grows, we still need just one person to drive the van and unload the boxes. 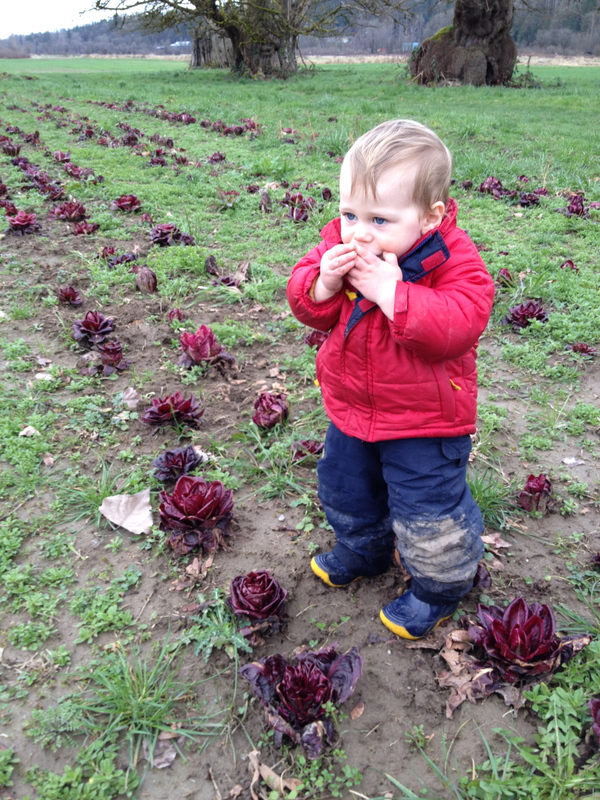 We don’t plan any rapid expansion of our CSA program, but gradually extending our season is the first step. Well, I guess that’s it for today. 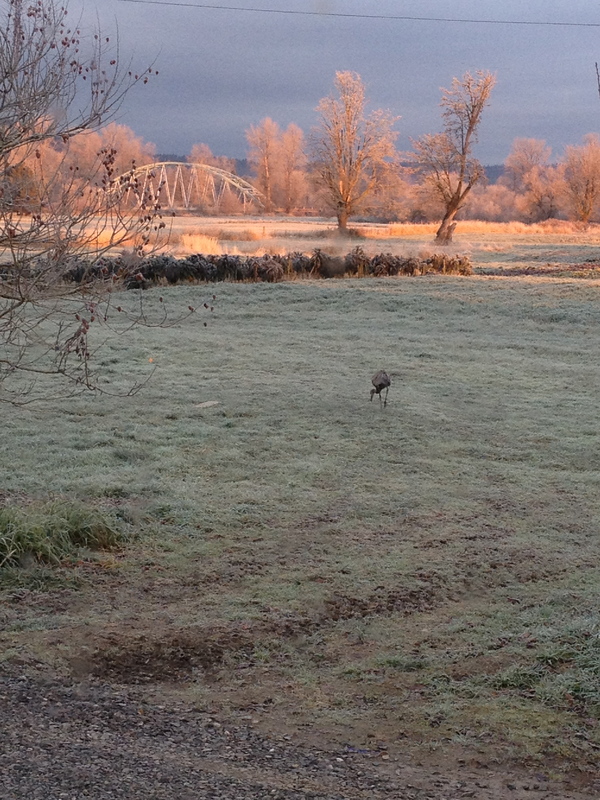 Stay tuned for more exciting late-winter happenings, and think sun!